When you are looking to pass an exam and you want to study at your own pace, then you can't beat this Exam Preparation Library. Mike Holt, NEC expert, and one of the top Electrical Instructors in the United States walks you through the 2011 NEC Changes and gives you in-depth training on all the Electrical Calculations that you will need to pass your exam. This package includes Mike's best-selling full-color Exam Preparation textbook that will give you a review on Theory, in-depth training for Electrical Calculations, as well as over 1,100 NEC Review questions. 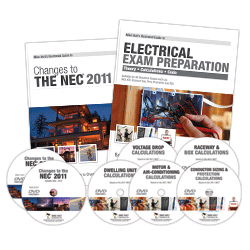 You will also receive Mike's 2011 Changes to the NEC DVD course to give you the information you need to know about all the important changes to the 2011 code cycle.